ERIE, Pa. (Jan. 14, 2015) – Going to class just got a whole lot cooler. Executives at Erie Insurance (NASDAQ: ERIE) cut the ribbon today on the company’s new state-of-the-art Technical Learning Center – a hands-on claims training facility that features 14 vehicle bays, a three-story model home made from 400 different building materials, and other training aides. The 52,000-square-foot space will serve as a giant interactive classroom for employees and agents to get an up-close look at property damage sustained to vehicles, homes and businesses. 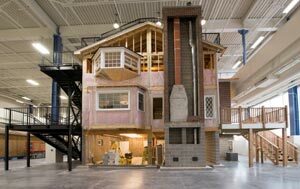 ERIE employees, media and invited guests got the first look at the hands-on facility, which features a full-size house with an attic and basement, as well as sprinkler and building material work stations. 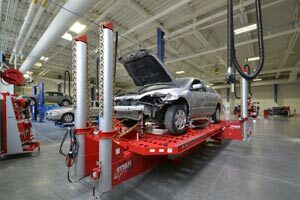 It also includes vehicle equipment stations with lifts, frame repair stations, wheel alignment machines, and prep and paint booths. “Our claims service is the cornerstone of our business. While home and auto technology is always changing, our commitment to being ‘Above All in Service’ is constant,” said Erie Insurance’s Executive Vice President of Services Chip Dufala. “This training facility will enable employees to touch, feel, build, and get a firsthand look at damage they will encounter in the field. That makes for better learning – and, ultimately, a better customer experience. The new facility also includes an installation by found-object artist Michelle Stitzlein who recreated the ERIE logo from repurposed automotive and building materials. The ribbon-cutting ceremony at the Technical Learning Center was part of a year-long celebration at Erie Insurance which celebrates its 90th anniversary in 2015. According to A.M. Best Company, Erie Insurance Group, based in Erie, Pennsylvania, is the 11th largest homeowners insurer and 12th largest automobile insurer in the United States based on direct premiums written and the 16th largest property/casualty insurer in the United States based on total lines net premium written. The Group, rated A+ (Superior) by A.M. Best Company, has more than 4.9 million policies in force and operates in 12 states and the District of Columbia. Erie Insurance Group is a FORTUNE 500 and Barron’s 500 company. Erie Insurance is proud to have received the J.D. Power award for “Highest in Customer Satisfaction with the Auto Insurance Purchase Experience” two years in a row. ERIE has also been recognized by Forbes as one of America's 50 Most Trustworthy Financial Companies and is on the list of Ward's 50 Group of top performing insurance companies, which analyzes the financial performance of 3,000 property and casualty companies and recognizes the top performers for achieving outstanding results in safety, consistency and financial performance over a five-year period (2009-2013). 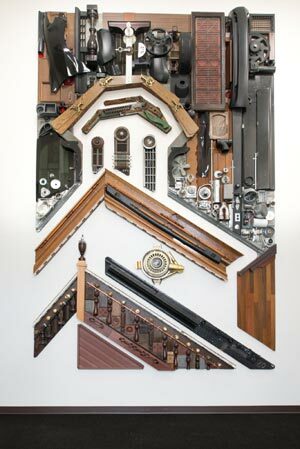 Found-object artist and sculptor Michelle Stitzlein crafted the Erie Insurance logo from repurposed auto and construction materials. The piece hangs in the lobby of the company’s new Technical Learning Center. The Technical Learning Center at Erie Insurance features 14 vehicle bays for employees to learn about damage on a wide range of vehicles. More than 400 different building materials were used in the construction of the three-story house within the Technical Learning Center at Erie Insurance. The facility will provide employees with opportunities to learn about the types of damage that can occur to homes.